This entry was posted on December 30, 2013, in Learning to Swim, Swim Heroes, Swimcrest Swimmers. Bookmark the permalink. Today requires a special appreciation of one of my fantastic students. Just over one year ago, Kyle came to me for the first time. 11-years-old, he was at the point where it felt REALLY important to learn to swim. And yet at that age, it’s a hard thing to do. Your friends can swim, your family can swim, and the self-consciousness that haunts us all is really beginning to kick in. But Kyle came. With a smile and eagerness that made every lesson a pleasure for me, he came once a week. He learned how to balance in the water so that he didn’t sink as soon as he got in. He learned to kick. He learned to work from his core–and what his core is! He learned how to work with the water instead of against it. And little by little, things started to change. 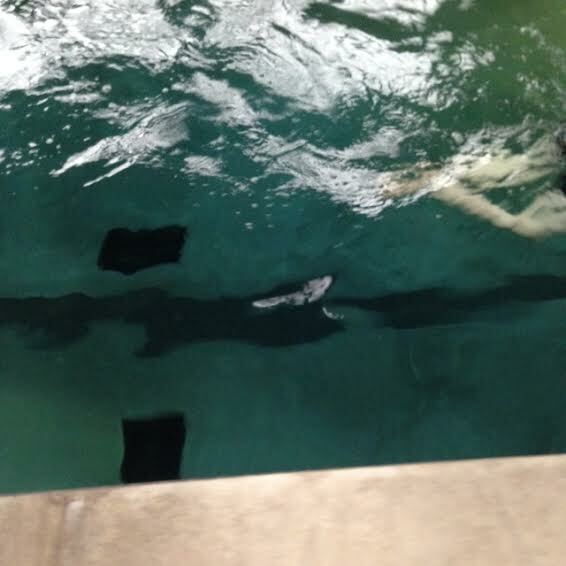 Before long, he did his first 25-yard swim, freestyle. Then his first 50 yards, last January 6th, with the modest goal of doing 75 yards by the Spring. Each time Kyle set a goal for himself, he blew by it, doubling his distances and decreasing his times. Then we discovered Breaststroke and things really took off. This was Kyle’s stroke for sure! By the end of January, he was doing 75 yards and had figured out how to tread water. At the end of April, he swam 100 yards but didn’t stop there and did a 150 instead, just because. Sometimes, I had to give Kyle a reality check. As he increased his distances and chose new goals, I’d stop him, look him in the eyes and say, “You do realize that most of my adult clients aspire to doing what you are capable of?” because he was so matter of fact about what was happening. But because it was so new for him, and he had no frame of reference, he didn’t know how amazingly he was progressing. We continued. Through the Spring. Through Summer. Through his trips to lakes where he’d never before been able to swim. Through summer camp swimming. And his distance continued to grow. All breaststroke. Early May brought 350 yards of continuous swimming. Slow and confident. I started to joke with his parents that he was becoming my science experiment. Just how much would he swim? 450 yards in early June, and a week later, 525 at a faster pace than the previous week. By early August, 800 yards with complete goggle failure and throwing them off as he swam. No panic. No sinking. Just seamless, calm and relaxed swimming. August 20th was 1000 yards. One Thousand Yards of continuous breaststroke for a boy who a year before could not stay afloat. And if you have any knowledge of breaststroke, you know that 1000 yards of it is, well, A Lot. My notes were filled with smiley faces I drew as he swam and the words Yahoo! and Wow! because to be honest, I’m not sure who was more excited. By October over 1100 yards, then 3 x 500 breaststroke. Steady growth, always challenging himself to go just a little bit farther, to steamline just a little bit more, to go just a little bit faster. And then, yesterday, Kyle swam his first mile. Let me write that again so you know you have read it correctly. Kyle Swam His First Continuous Mile of Breaststroke. No breaks. No stopping for water. No feeling like he couldn’t do it. Relaxed, confident, calm, and seamless swimming. Yahoo! Whoo Hoo! Yay! Yippee! You Rock! That’s not all I have to say. I truly and completely believe that anyone can learn to swim. If we let go of our our fears, our belief that we can’t, the pressure we put on ourselves, and instead let ourselves work with the water and enjoy it, we can do it. Kyle did. Thank you to Kyle for inspiring me every time I watch you swim. « This is why I teach.